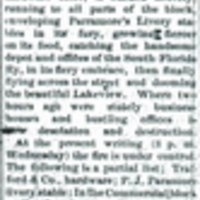 A newspaper article about a fire that occurred on August 18, 1886, in Sanford, Florida. According to the article, the fire was first discovered in the Trafford and Company hardware store, located at the corner of North Park Avenue and West Commercial Street. The fire spread to Parramore's Livery stables and the depot and offices of the South Florida Railroad Company. Print reproduction of microfilmed newspaper advertisements: The South Florida Argus, August 19, 1886: Microfilm Cabinet, Reel BN06021, Sanford Museum, Sanford, Florida. Microfilmed newspaper advertisements: The South Florida Argus, August 19, 1886: Microfilm Cabinet, Reel BN06021, Sanford Museum, Sanford, Florida. Digital reproduction of printed microfilm newspaper article: The South Florida Argus, August 19, 1886: Microfilm Cabinet, Reel BN06021, Sanford Museum, Sanford, Florida. Copyright to this resource is held by The South Florida Argus and is provided here by RICHES of Central Florida for educational purposes only. “FIRE!! The Fire Fiend's Destructive Work at Sanford.” RICHES of Central Florida accessed April 25, 2019, https://richesmi.cah.ucf.edu/omeka/items/show/4294.